#22 marks the first time that Aquaman and the First King actually square off against each other, and in a most brutal fashion. We’ve been seeing glimpses of the First King these last few issues and this time, Geoff holds almost nothing back. From the first page to the last, this issue is an adrenaline ride as the two most powerful men on the planet, or rather, the Seven Seas, go at each other without holding back. Geoff mixes in ample exposition to his action scenes, and treats the reader to so many gob-smacking twists that its a wonder he managed to fit everything together so well, so seamlessly. Of course, that’s not all that’s going on in this issue. Previously we saw that a villain named Scavenger had invaded Atlantis with a fleet of submarines and had initiated a brutal attack on the underwater kingdom. There is panic in the city since Aquaman is nowhere to be found and the Atlantean forces are struggling to hold the invaders back. We still don’t know what Scavenger’s beef with Aquaman is all about, which I think is the only downside to this issue, from a story perspective. Given that there are still many mysteries about the First King, inspite of all the new revelations regarding his ancestry to Aquaman, I was hoping for something about the Scavenger as well. Still, the entire attack sequence is a thing of beauty. We get to see a lot of what’s happening in Atlantis from both sides of the conflict: Scavenger and his forces as they continue their assault, and the Atlanteans retaliating under the leadership of Commander Urn, who is quite possibly the most badass secondary character in the entire series so far. We even get to see some background stuff on Atlantis and its laws through Urn in a side moment that involves the traitor Vulko who betrayed Aquaman during the Throne of Atlantis crossover and caused a war between the underwater kingdom and the surface world. And the side story with Aquaman and Orm’s sister Tula, the disgraced Atlantean Swatt and the warrior Murk continues as well as they make their way to Orm’s prison on the surface world, to free him and return him to his rightful place as the King of Atlantis. That story has a ton of potential, particularly in the context of the Aquaman and First King conflict. Can’t wait to see what’s going to happen there! The art in this book is absolutely gorgeous. There are a fair number of double page spreads packed with an incredible amount of detail and I loved them, watching them again and again. Ivan Reis and Joe Prado were such an amazing fit on this book when it started, and I kind of miss them on the title still. But all the same, Paul Pelletier, Sean Parsons and Rod Reis are doing an amazing job here nonetheless. The art is really vibrant, and all the scenes pop out, whether they involve just characters talking or characters fighting, or the larger spreads such as the Atlantis/Scavenger battle. In particular, I really love the First King here. That zombie dude is a badass, no matter how you look at him. Overall, this was a fantastic issue, and certainly proves yet again that Geoff Johns is a master of his craft and that he was/is the perfect man for this title. Originally meant to be the arc-finale issue, #23 comes quite close to finishing the story, but leaves a lot of plot elements open for the next two issues, which will indeed resolve the entire arc. And the wait is going to be a long, long one. What describes this issue, within the context of the entire arc so far, is that it is packed to the brim with one awesome, mind-blowing sequence after another. And the ending, it is the most brilliant ending to an issue in the entire series yet. This issue really conflicted me. And not because anything in it was bad, far from it. Geoff Johns has been delivering one crazy-awesome issue after another throughout this series, and quite realistically, he is going to reach a level where he is at his absolute best. So what happens when he writes an issue that is beyond his absolute best? Are there really any descriptions for those levels? And yes, I do say levels because I expect him to continue this crazy streak. Whether it is Aquaman and Mera breaking off from Nereus and the First King, or Urn leading the fight against Scavenger, or Aquaman returning to Atlantis to save his city, or even the Xebelite forces coming to the city as well, there is a non-stop meta-action sequence going on here. Everything flows together naturally and without any bumps in the story or the art. 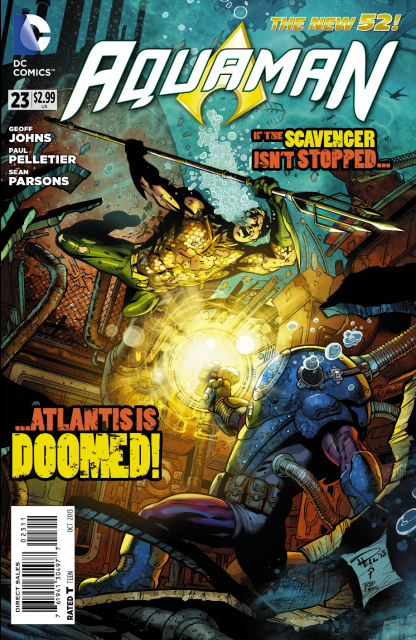 More than anything, this issue is about Aquaman proving that he is the leader of Atlantis, especially after the revelations of the previous issue. Unfortunately, this also means that Aquaman has to take some really drastic measures to save the city that is alien to him but is also his home, and this taxes him to the limits and beyond. 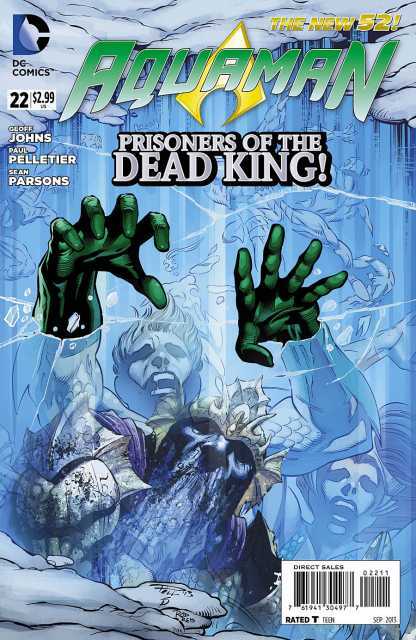 Last issue, we saw that he had an extremely rough one-on-one with the First King and the fight against Scavenger’s forces followed almost immediately, and now we see Aquaman overextend himself drastically. All of this then leads into the final two pages of the comic, with a brilliant one-panel final page that was just…. doubly amazing. Not sure how else I can describe that page. Let’s just say that an… older Aquaman is coming back finally, the kind we saw in the Justice League animated series. I’m all for that. The art team also steps up to the challenge of Geoff’s script and it delivers an absolutely gorgeous 22 pages of breathtaking art. More amazing double-page spreads, more personal moments with Aquaman, Urn’s complete badassery, the return of a… monster, the Xebelites’ return, and so on. Paul Pelletier, Sean Parsons and Rod Reis are making me really not miss Ivan Reis and Joe Prado, and that’s a great thing! There has been a great amount of consistency throughout their issues, and I can’t wait to see where they all go next, with next month’s two Villains Month issues, Black Manta and Ocean Master, and then the next two installments of the Death of the King arc. Geoff Johns has been an incredibly consistent writer for me, across four titles of late, and I’m just amazed that he can put out so much great work across so many different titles. Just amazing. His Aquaman is absolutely magnificent and I hope he keeps it that way. And also that Pelletier, Parsons and Reis have a long, long run on the title. More Aquaman: #0-12, #13-15, #16-21. Posted on August 30, 2013, in 2013 Reading Challenge, 2013 Writing Challenge, Challenges, Comics Reviews, Review Central and tagged 2013 Reading Challenge, 2013 Writing Challenge, Aquaman, Arthur Curry, Atlantis, Challenges, Comics, Comics Reviews, DC Comics, Death of a King, First King, Geoff Johns, Mera, New 52, Ocean Master, Paul Pelletier, Review, Review Central, Sean Parsons. Bookmark the permalink. 16 Comments.